When you write a cover letter or send an email message that includes a cover letter, you need to provide your contact information in a clear and easily readable format. It seems simple, but it’s important to do it properly. Your contact information will include your street address, phone number, and email, but your letter should indicate the quickest way to contact you. If you're sending a paper cover letter, for example, you might write, “You can reach me during business hours at the phone number above.” Or in an email message, add this final sentence: "I look forward to hearing from you. My email address and phone number are with my signature below." You've just made it easier for the recipient to reach you. When you are writing a cover letter to print and mail, or post on a job board, the top section should include information on how the prospective employer can contact you. List your contact information at the top left. Use single spacing and a consistent font, and format it as a block of information. Include your full mailing address, your phone number, and your email address. Leave a space, add the date, and then enter the recipient’s name and address, single-spaced. Include the name and title of the person you are sending the letter to and the organization name. It's smart to use the name of the person who's receiving the letter. If you have to, check the company website or LinkedIn to find out the department manager's name. When in doubt, call the company's main line and ask the receptionist. If you cannot determine the contact's name, use the name of the department in the contact information. Here’s a sample format of contact information for an applicant and the company addressed. If you include your email information, be sure to check your inbox often so that you can respond quickly to any contacts. 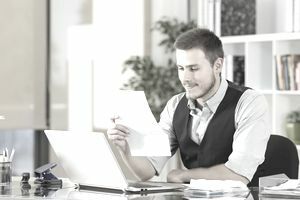 The standard business style for email communications is different, because the screen size may not allow for a quick eye scan of the full text the way a piece of paper does. Instead of listing your contact information at the top, include it in your signature. Do not include the employer's contact information. Your signature can omit your street address if you prefer. Otherwise, just provide your name, email address, and phone number. You can also include relevant links to your social footprint, such as your LinkedIn profile or business website. These can add additional information and indicate your stature in your profession. A small graphic may be acceptable in your signature, such as a written signature below the text. But don’t get carried away. Keep it simple and professional. It’s best to use the same basic format every time to share your contact details in a letter or by email. Saving an example of each and cutting and pasting it as needed will ensure that you never make a typographical error or leave anything out of an important message.